The one Tuesday highlight we didn’t want to miss was the unveiling of the Martin Jetpack. From the talk I had been hearing around the grounds, everyone else wanted to see it fly too. The Jetpack unveiling was probably the most hyped event of the show and was scheduled for 9:30AM. When we got to AeroShell Square an hour before, there was already a large crowd gathered. Apparently the Martin team hadn’t anticipated the response. They, and security from EAA, had to spend the next hour and a half trying move the crowd back so they could rope off a demo area. If they had done that earlier, things would have gone much smoother. As they were setting up, the team kept the Jetpack covered but had to relocate it several time. What bothered me was that each time they did, it took four of them to pick it up and move it. Not surprising when you consider that the machine is big, bulky and weighs 250 pounds empty. With a full 5 gallons of gas, that comes to 280 pounds. This is not an aircraft that you can set up and launch without some help. The unveiling itself finally got started a little after 10AM. After introductions and a little history of the program, the machine was shown. While it is called Jetpack, this aircraft is not a jet. It uses a reciprocating engine driving two ducted fans. It is also not a pack in that you don’t just wear it on you back. The engine and fans are mounted on a stand which the pilot steps into and straps to. The “flight” itself was pretty anticlimactic. Click the picture or go here to see my video.. Designer Glenn Martin said that, for safety reasons, the flight would be a brief hover with the Jetpack held down by two assistants. That is just what happened. Harrison Martin, son of Glenn, lifted off and hovered about 2 feet off the ground as two people held onto the side handles. The group moved forward and back a few feet then brought the machine back to the ground. Total flight time was probably well under a minute. If you get the idea that I was not impressed, you are right. The idea of an aircraft that you can wear on your back and fly to work is certainly appealing but, this is not that aircraft. It is too expensive, too big and seems too hard to control. Watch the videos on the Martin website to get an idea of what flight in the Jetpack looks like. It has a ways to go before it would interest me. The rest of our morning was spent in the hangers looking over the displays from the hundreds of aviation vendors who had booths at the show. While we saw many very interesting products, nothing tempted any dollars out of my wallet. Afternoon found us back on the flight line for the day’s airshow. The display portion this time started with a Rocket Racing League flight. This was not an actual race but, a single ship demo flight. The giant screens that will be part of the racing events were not in place for this flight. The bright white light and the sound of that rocket engine as it was cycled on and off were impressive. 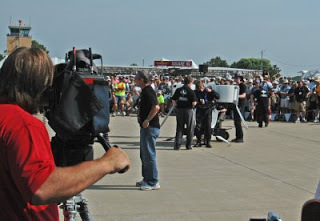 I look forward to seeing an actual race – maybe at next year’s Airventure. The rest of the display was a warbird extravaganza. It was wonderful so many of these great old airplanes in the air at once. The airshow itself featured: The Liberty Parachute Team, a repeat performance by Chuck Aaron in the Red Bull Helicopter, Aeroshell Team, Bob Davis, Mike Goulian, Gene Soucy, Sean Tucker, Matt Younkin doing aerobatics in a Twin Beech, the Harrier II again and, the departure of the Boeing Dreamlifter. I added a JetPack video to this post.